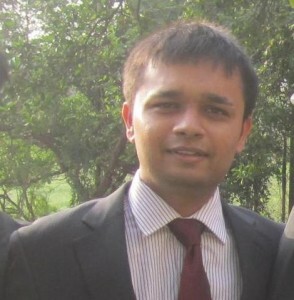 Mr.Somay Munde, a Chemical Engineer from IIT Bombay is a perfect combination of determination and intelligence. 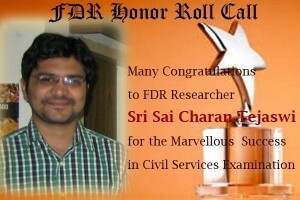 He developed a passion to pursue Civil Service since his IIT days and has been preparing since then. He was successful in the UPSC Exam 2016, and will be entering the prestigious public service soon. He had a brief stint at Foundation for Democratic Reforms where he assisted with the research on healthcare reforms. In an interaction with the FDR team, he shares his thoughts on what went into the realization of his dream. Firstly, hearty congratulations on behalf of FDR team on this remarkable achievement! We are happy to note that your efforts and hard work have been finally rewarded. Let us start..
1. How do you visualize your success? What factors do you think contributed to your success in the examination? I visualize my success as a culmination of intense preparation, determination, and perseverance. I view it as a sweet fruits of not only my endless labour towards one single goal, but also contribution of numerous people towards this wonderful journey. The key factors that contributed to my success were my parents, my small study group consisting of close friends, and of course my own determination. 2.Did you have this idea of becoming a Civil Servant from your childhood or were you inspired by someone? Unlike many aspirants who dreamt of being a civil servant right from their childhood, my decision to pursue civil services was rather an evolved decision. I decided to give the examination in the last semester of my college. After I decided to pursue the services examination, I started my preparation. 3.You have done your M.Tech in Chemical Engineering… what attracted you towards Civil Service instead of pursuing a career in your background? Did you face any difficulties while preparing for the exam, given that you come from an engineering background? Yes, I did my B.Tech and M.Tech from IIT B. When I entered IIT, I was just like any other college student who wanted to get good grades and get placed into a good company. But over a period of time my inclination to the civil services increased and I decided to change my career path. Being a science student all my life I am more comfortable thinking in binary terms, i.e, questions in sciences are direct and objective and answers to them clear-cut. But, in CSE we face a number of topics where a lot of description and subjectivity is required. Opinions matter more than facts. So, initially it was a bit tough to adjust to the demands of the paper, but nonetheless it was a great learning experience to deal with topics with which I have been uncomfortable throughout my life. It added a new dimension to my personality. 4. What were the pressures and what was the support system that kept your energy levels up? Pressures were tremendous. Especially because the scale of competition is immense and statistically it seems almost impossible to feature in 0.3% of the 9 lakh candidates. Also, when I was studying and trying to crack this exam, my friends were busy climbing corporate ladders and moving ahead in life. This added even more pressure. Fortunately, I had developed numerous support systems. I surrounded myself with motivated, hardworking and positive aspirants with whom I studied. My parents were of immense help when it came to calming my nerves. I used to take time to relax and exercise. I regularly took breaks and ensured that life did not become monotonous. 5. Did you take up any coaching? If yes, did it help you in the preparation? If no, how did you prepare for your exams? I did initially join coaching but left it in two months as I did not find it fruitful. I prepared on my own and tried to read original textbooks as much as possible. For example, in sociology I regularly referred to standard reference books than coaching class material. I relied on making my own notes. It helped me memorize them better and organize my thoughts more efficiently. 6.You had a brief association with Foundation for Democratic Reforms… tell us, did you get any insights on policy issues from here? I worked as an intern in FDR. I worked on numerous projects. The one I found the most interesting was the Health sector project. I did background research and formulated key documents that went on to shape the final presentation in front of Niti Aayog. 7.Had you not been selected…which other service/ career would you have chosen? I would have continued in the field of developmental research. I had been offered a position of Research Associate in J-PAL. Further down the line I planned to pursue PhD in developmental economics. 8.In your preparation, how did you handle the challenge of information overload? How did you maintain your focus and avoid distractions? The key to information overload is information management. The biggest problem that many aspirants face is that they tend to refer to numerous books on a single subject. I, rather focused on standards basic books for each subject and read them numerous times. Because I made my own notes, I did not have to work especially hard to remember them. I used Evernote to better organize my notes and manage information properly. 9.What challenges do you see in the country and how do you wish to resolve them? Our country faces numerous challenges. But the key solution to most challenges lies in policy implementation and governance. We have laws but do not implement them. We have beautifully crafted policies but rarely attention is given to its performance. It is often said that India is most regulated but least governed country in the world. My efforts would revolve around improving governance and delivering essential services in an accountable manner to everyone, be it health, education etc. 10.What is your advice to the future aspirants? My advice to future aspirants would be to be consistent, persevere, and be original. Rely on less material with numerous revisions and always read original texts. I am sure you will succeed in achieving your dream.